A couple of weeks ago Janis and I visited our friends Paul and Cheryl for the weekend. They recently retired to Powell River, though Cheryl still telecommutes. 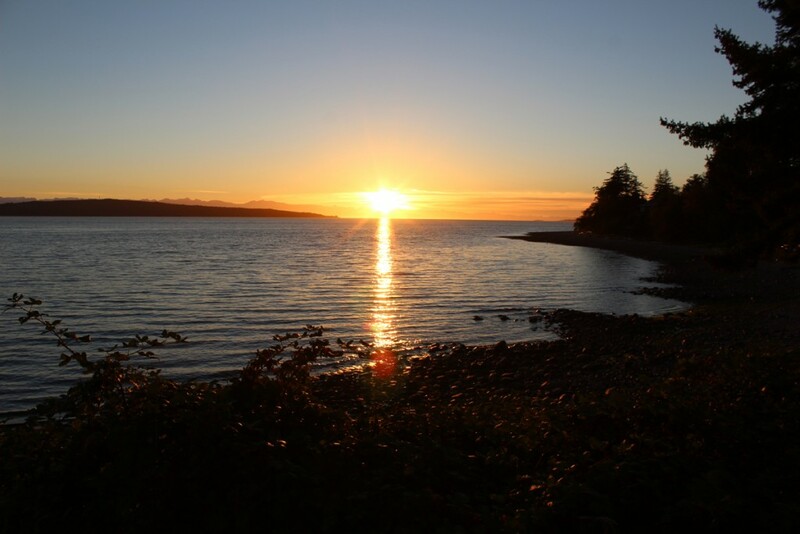 A lot of people think the Sunshine Coast is just the Sechelt Peninsula, but that’s only about half of it. It actually extends all the way to Lund, about a half hour north of Powell River. 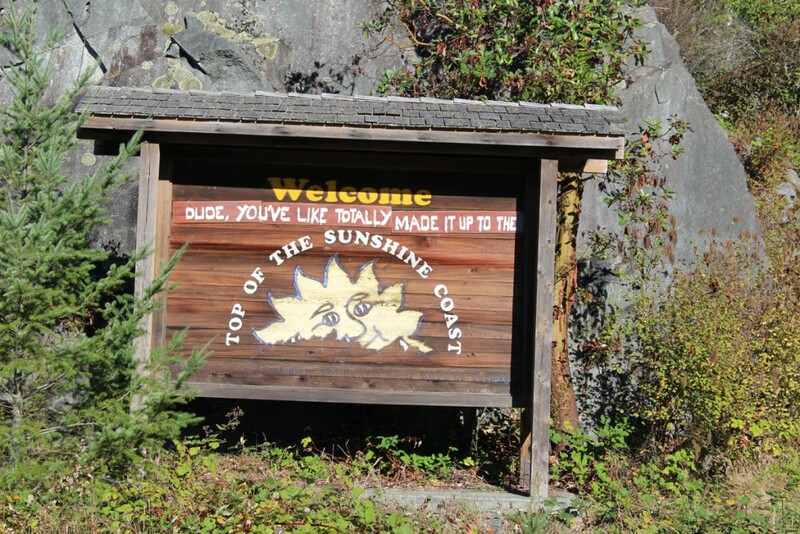 When you take the ferry from Earl’s Cove, there’s a big sign greeting you at Saltery Bay that says, “Welcome dude, you’ve like totally made it up to the Top of the Sunshine Coast!” Yeah, the Sunshine Coast is pretty laid back, dude! To get there from Vancouver, you need to take the Langdale Ferry from Horseshoe Bay. The Sechelt is isolated and you can only get there and back by ferry, so when you go, you’re buying a return ticket. You don’t have to buy a ticket to go back to the mainland. At Langdale, you drive up the peninsula to Earl’s Cove and then the ferry hop to Saltery Bay. Here’s a money-saving tip. Buy an Experience Card online from B.C. Ferries. It gets you discounted rates on many of the ferries plying the coast, including the ones to and from the Sechelt. 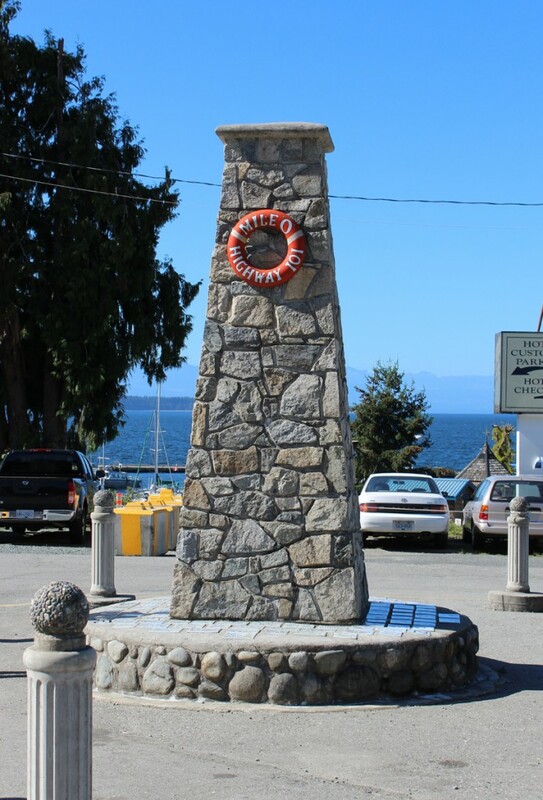 Powell River is about 28 kilometres from Saltery Bay, a half hour drive. It’s an old mill town which has done much to preserve some of its history. The mill was built in 1908 and the company town in 1910. The mill was, at one time, the largest pulp and paper mill in the world. But the mill has seen better days and is a shadow of its former self, though still operating. 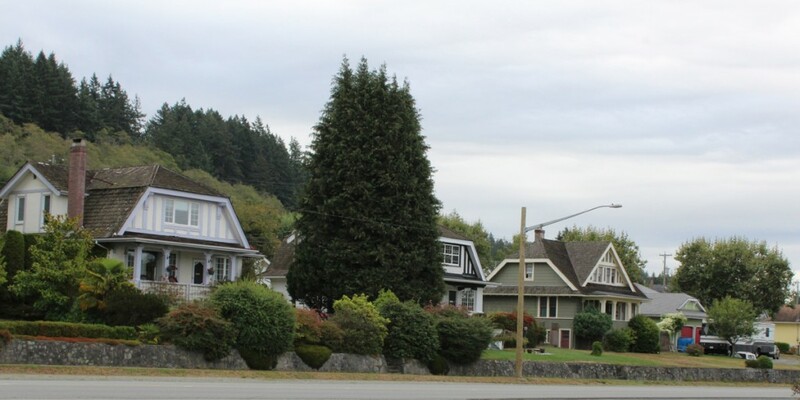 Our hosts told us that the average age in Powell River is eight years higher than the provincial average as so many people have moved away to find work. And many seniors are finding it an attractive place to retire. There is a lookout along the highway that offers a panoramic view of the mill and the Incredible Hulks. The hulks are a collection of old concrete ships that have been chained together to form a breakwater. An information board tells us that the hulks have been a feature of the waterfront since 1930. 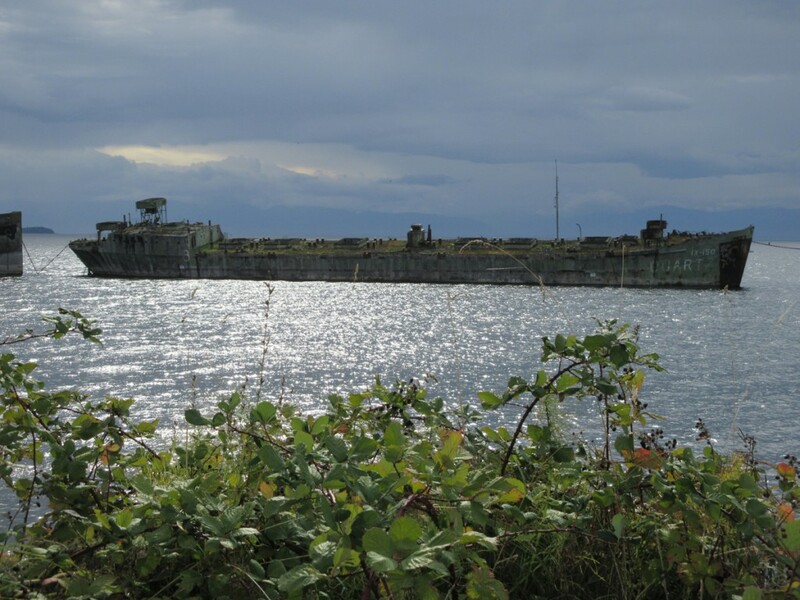 “Over the years, 19 ships built of wood, steel and reinforced concrete have been brought to Powell River for use in the breakwater. (They) were built for use in the 1st and 2nd World Wars when there was a shortage of plate steel for ships construction.” They were unable to compete with steel ships when peace arrived. The old historic townsite has been designated a National Historic District “with over 400 original buildings contained within the original borders of the 1910 town plan.” Our hosts took us for a casual drive through the old town and pointed out many of its historic buildings. I’ll include most of them in a separate photo gallery and there is a link at the end of the article to the townsite’s website. Here I’ll focus on one particular building, the Patricia Theatre. The Patricia was originally at the location where the Cenotaph is today. Built in 1913, it featured silent films with live piano accompaniment. The actors John Barrymore and Delores Costello visited the theatre in person in the 1920s. In 1928, it was relocated to a new building, the current one shown in the picture above. 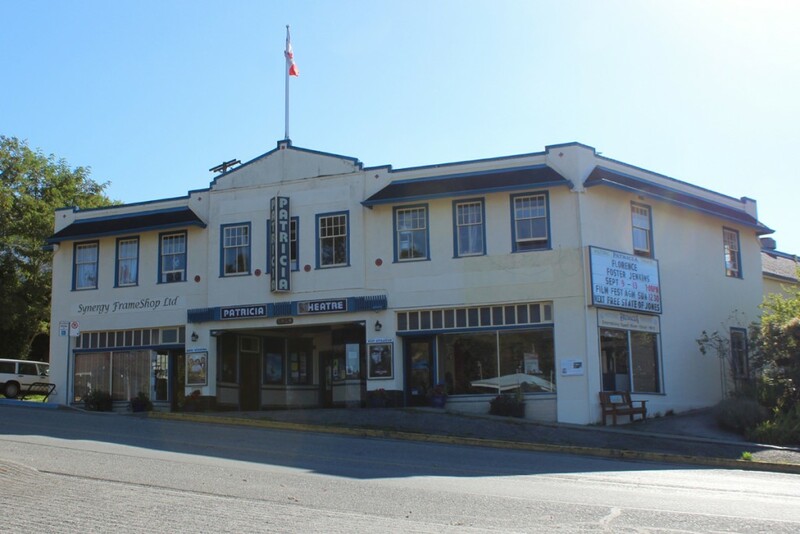 Still operating today, it is the oldest continuously operating movie theatre in Canada. Paul, Cheryl, Janis and I attended a movie showing (Florence Foster Jenkins starring Meryl Streep and Hugh Grant) and I wish I had brought my camera. The interior is amazing with large mural panels and an old style feel to the place. The projection equipment was modernized to run digital movies at a cost of $90,000 in 2012, funds raised by volunteers of the historical society. You can see more pictures at the theatre’s official website, linked at the end of this article. Some of the carefully maintained homes of the historic townsite. These larger ones on the main drag belonged to mill executives and management originally. 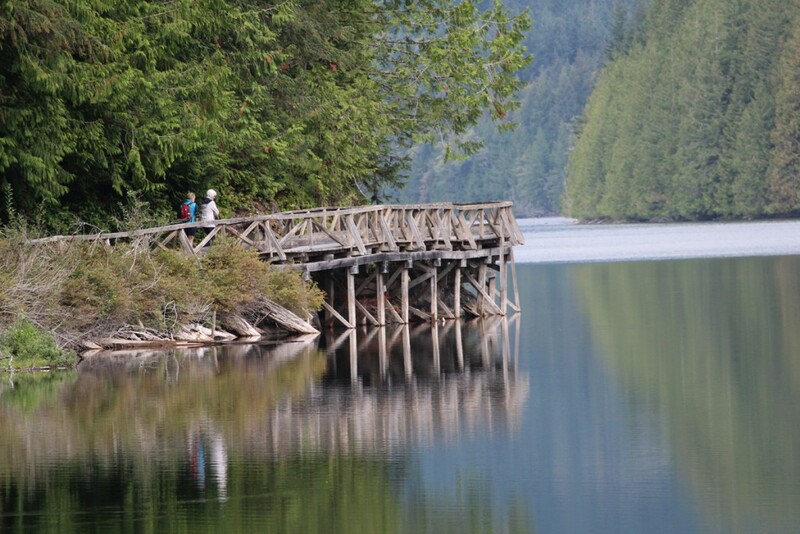 Powell River abounds in hiking and nature trails as well. One easily accessible trail is the Willingdon Beach Trail just off Marine Avenue. The trail used to be a logging road and it is now a walking trail and an outdoor museum. All along the trail are logging artifacts of a bygone era, each with signs explaining what we see. Steam donkey dating from the 1920s. 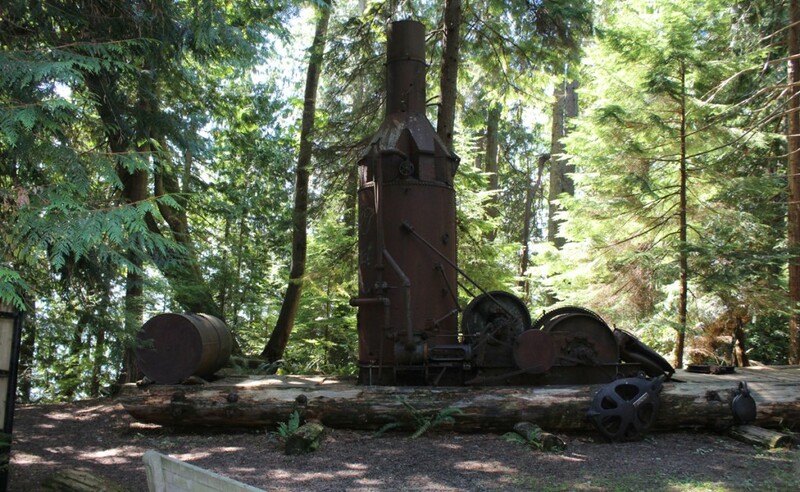 The pièce de résistance is a steam donkey that the Powell River Forestry Museum Society managed to retrieve from a ridge north of Haywire Bay on Powell Lake. The society preserved it and moved it by helicopter to the Willingdon Beach Trail in 2001-2002. The steam donkey is a steam-powered winch or logging engine. This particular one is #357 built by the Empire Manufacturing Company in 1920 and used into the 1960s. 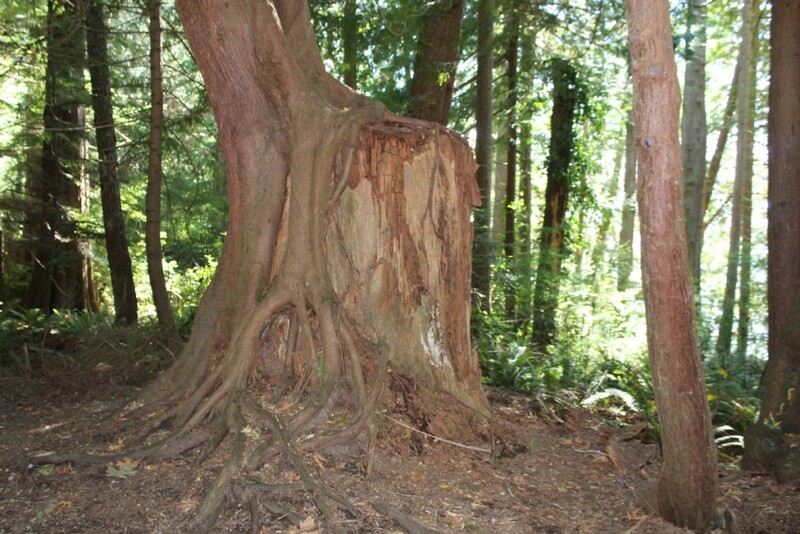 Tree growing out of an old stump. Not only are there a lot of logging artifacts, the flora along the trail are a great example of how the forest renews itself. Heavily logged at one time, you’ll find many trees growing out of the stumps of long gone brethren. At the head of the trail is a sign telling you that you can get an audio guide on your cellphone by visiting Project Art Zoundzones. Just click on the link for the Willingdon Beach Trail. This is just one of four city trails, each two kilometres or less. The others are the Willingdon Creek Trail, the Sea Walk Trail and the Valentine Mountain Trail. But for the serious hiker, there are many more. Inland Lake Trail is a beautiful 13 kilometre walking path around the lake. The trail is well groomed and maintained and hugs the shoreline. At some points it goes out over the water along boardwalks. And it is remote enough to be away from the noise and traffic of the city. Janis and Cheryl walking along the Inland Lake Trail. This is one of several boardwalks along the trail which circumnavigates the lake. There are always a number of activities going on in Powell River, especially on the weekends, including a regular farmers market. The city itself is much larger than in the company town days as a number of towns and villages were incorporated into the city. One has the colorful name of Cranberry. One day our hosts took us to Lund 24 kilometres up the road. Along the way we visited the Okeover Inlet Marina, a very picturesque spot. On a ridge above the marina is the Laughing Oyster Restaurant, a fine dining experience with a magnificent view. Alongside the dock you’ll find many of the tiny jellyfish common in coastal B.C. waters. Lund is a small coastal village with a fair size marina, several restaurants, a hotel and several shops including an art gallery gift shop. It is also the beginning of Highway 101, also known as the Pacific Coastal Route. This highway network runs 15,202 kilometres to Quellon, Poro Monte, Chile, one of the longest roadways in the world. Mile 0 Marker of the Pacific Coastal Highway. Lund was founded by a Swede named Charlie Thulin in 1889. He called it Lund after a place in Sweden. 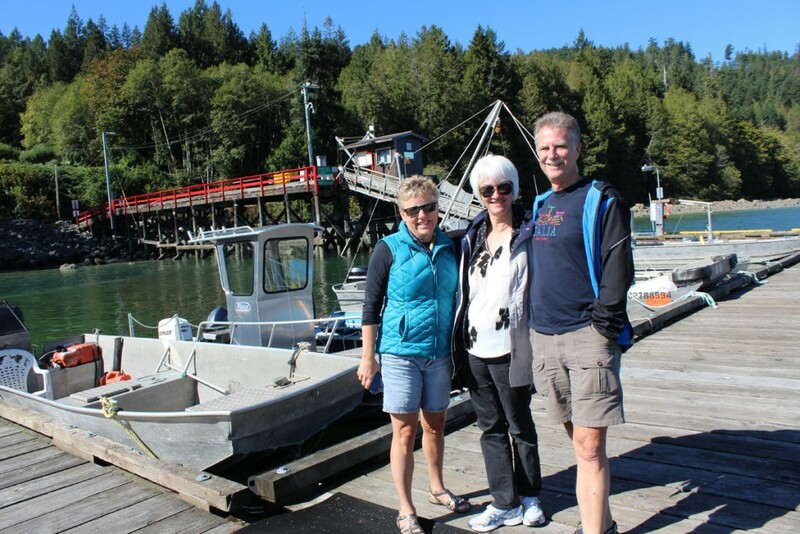 Today the town also serves as the home of the Savary Island Water Taxi. It is a passenger only ferry. All cars on Savary were barged in. 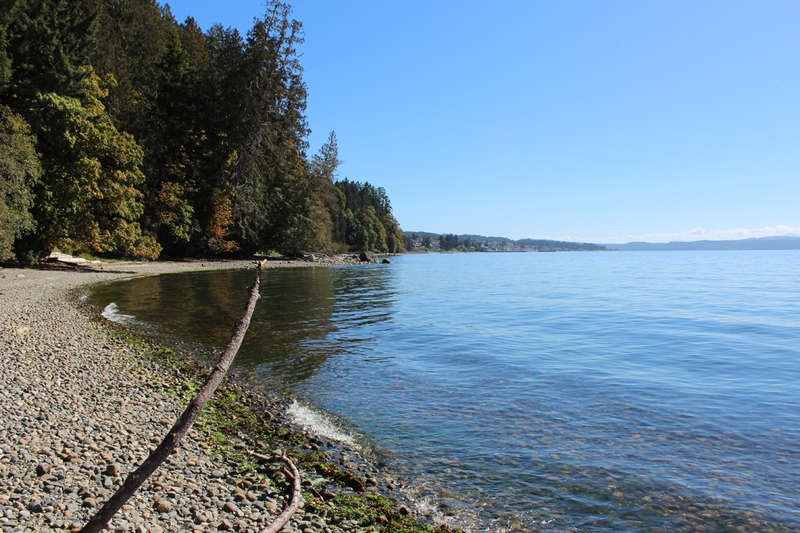 Savary Island is itself worth a visit. We were there back in the 1990s. But that is a topic for another post. Panoramic shot of Lund harbour. On Sunday evening, our last night before heading back Monday morning, we went for dinner to a nice little place on the south end of town called the Savoury Bight Seaside Restaurant. 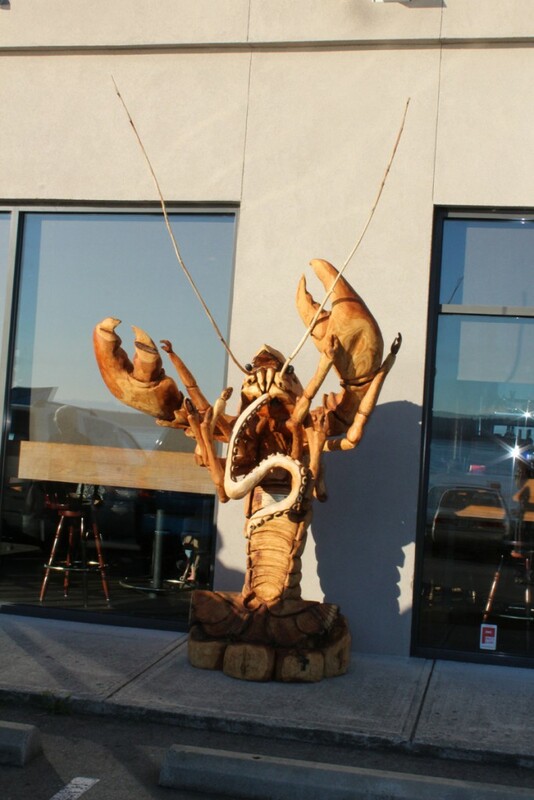 In front of the restaurant is a magnificent wooden sculpture of a giant lobster eating the tentacle of an octopus. It was carved by chainsaw at a logging show a while back. Dinner was served on an outdoor patio which proffered a view of a magnificent sunset while we ate. The food was pretty good too. Sunset from the patio of the Savoury Bight Restaurant. The Sunshine Coast from Saltery Bay to Lund offers plenty for the visitor, whether it is the historic aspects of the area or the many natural wonders to take in. It is a hiker’s and camper’s dream with facilities along Powell and other lakes and along the coast. There is a lot to do there. Be sure to check out the additional photo galleries linked below as well as some significant websites you’ll find useful. Click on the links for the photo galleries or scroll on down if you are on the main page.